Christian Borle, center, joined by the big kids (and their guardians) he's invited into Willy Wonka's chocolate factory. Below, Emily Padgett and John Rubinstein, standing, with young actor Ryan Sell, are Charlie's mom and Grandpa Joe. That’s horrible, you say! How dare I cheer the deaths of children? How can I disparage one of your childhood touchstones? Well, to borrow a line from a famous candy-maker: “Strike that. Reverse it.” Aside from Charlie, all the “kids” in this re-conceived cousin of a production that ran for four years in London are played by adults. You can do things to grownups on stage that you can’t to children. The switch-up is one of the more effective devices employed by the “Charlie” creative team, which includes the composers of the musical “Hairspray.” But even it doesn't work consistently. When sausage-hoarding Augustus Gloop falls into a chocolate river, we soon see his disembodied head shoot up a discharge pipe, atop a rising fountain of fudge. The rubbery noggin could be a prop from a Wes Craven horror movie, but it hits the right note of wicked humor. Not so the death of Veruca Salt, portrayed here as a bratty Russian ballerina and heiress. You'll never forget seeing her torn limb from limb by big, black, nut-sorting squirrels, in a campy ballet sequence, but you'll be left queasy rather than entertained. Soooo … is “Charlie” appropriate for kids? Well, the only one near me at Friday night’s press performance, a young lady who looked to be about 10, was spellbound and she laughed out loud the entire time. And why shouldn’t she be happy? All of the Lunt-Fontanne Theater has been set up to mesmerize the modern young adult: “Rotten Behavior Detected” is the sign underneath a flashing emergency light on the theater’s 46th Street facade; confections for sale are “curated” by Dylan’s Candy Shop. Whimsically, young Charlie initiates one of the more wonderful moments of stage magic seen anywhere this season, crafting a note to chocolatier Will Wonka on the blank page of a notebook, folding it into a paper airplane and sending it soaring toward the mezzanine. But more often than it should, “Charlie” fails children when trying to speak to adults, and vice versa. Really Grandma Georgina … fart jokes? The setting is, vaguely, the present. Mike Teavee is a hashtag-spouting Idaho teen whose mother (Jackie Hoffman, in her stock, full-on alcoholic mode) observes: “And though he’s quite a malcontent / someday he might be president!” Violet Beauregarde is a tracksuit-wearing YouTube star with an 800 number to contact for endorsement deals. Stereotypes abound. 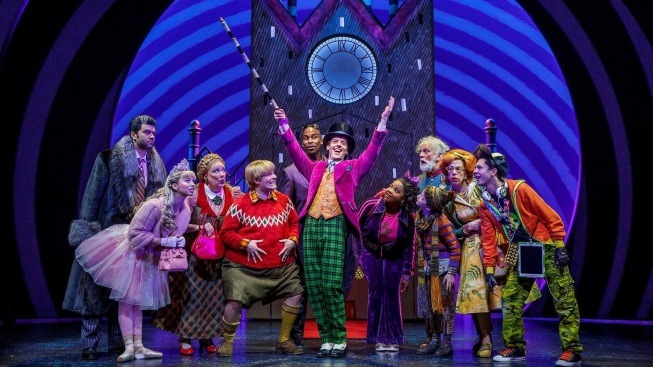 Christian Borle, the two-time Tony Award winner who starred earlier this season in “Falsettos,” is the second best thing about “Charlie and the Chocolate Factory,” oozing a cynicism that is simultaneously original and an homage to Gene Wilder, star of the 1971 film. Borle dances, he dutifully sings, he works hard. And you wouldn’t want your kid hanging around this fella, which is how it should be. The show opens with the actor singing “The Candy Man,” evoking one of the most fondly remembered moments from the movie. After that, the music is a combination of other songs from the film and mostly bland new work by Marc Shaiman and Scott Wittman. The set is minimalist, save for one scene in “a chocolate Eden,” a terrarium where you can eat the dandelions. I suspect adults will find both wanting, though things improve in the second act. 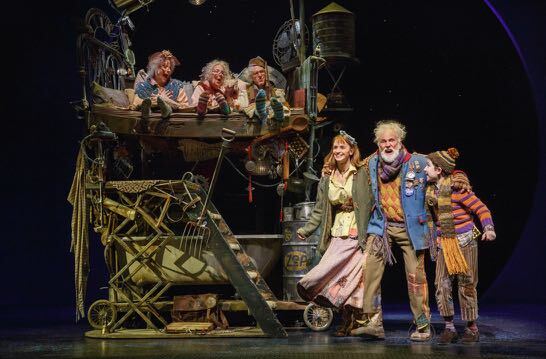 Veteran John Rubinstein works his charms as Grandpa Joe, who wears an upside down saucepan for a hat. Emily Padgett has a Tina Fey-like twinkle as Charlie’s put-upon mom, who shares a misguided ballet sequence with the ghost of Charlie’s dad. The red-headed Oompa-Loompas, Willy’s factory workers, are “humanettes,” adult actors dressed in black, so only their faces are visible, with puppet bodies. Given the talent and production values, I’m sure the musical will enjoy a long life on Broadway. But for all its attempts to recreate the delight of Roald Dahl’s story, it left me with something of a toothache. “Charlie and the Chocolate Factory,” at the Lunt-Fontanne Theatre, 205 W. 46th St. Tickets, on sale through April 22, 2018, $79 and up. Call 800-745-3000.